Situated roughly half way between the village of Llanychaer and the mountain of Garn Fawr, this is the longest stone row in Wales. 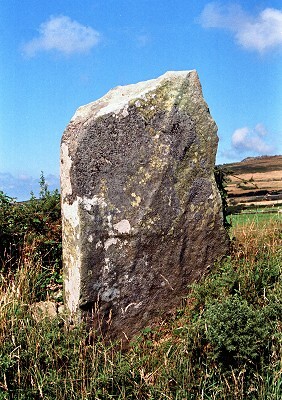 Originally it consisted of seven or eight stones in a 36 metre northwest - southeast alignment, although at least three stones are either fallen or removed. Four of the stones that now remain form part of a field boundary and hedgerow by the side of the road - two of them even act as gate posts. What purpose this line of stones served is not clear - they stand on the southwest side of a hillside at about 190 metres above sea level, half a mile north of the river Afon Gwaum. 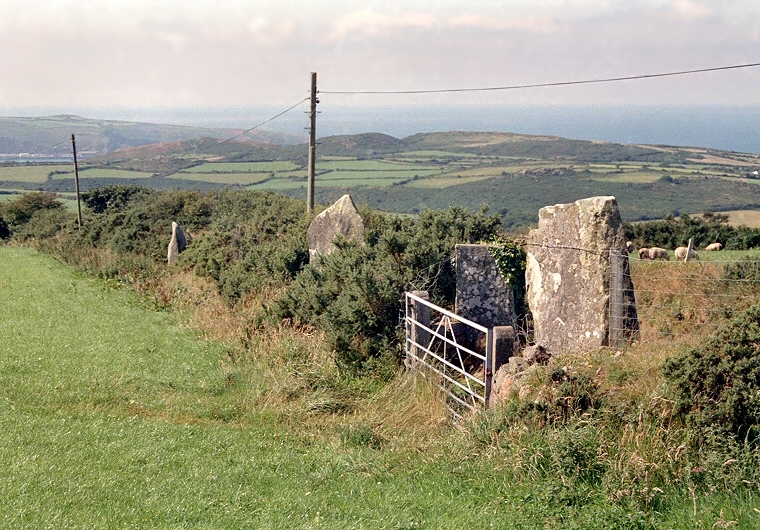 This river flows into the sea at Fishguard harbour 2 miles away to the west and it could be that the stone row marked a trackway along the side of the hill from somewhere like Carn Ingli or even further east, from Carn Menyn - the source of the Stonehenge bluestones. Could it be that these famous stones passed by Parc Y Meirw on their way to harbour to start their long sea journey to Salisbury Plain? The name of the site Parc Y Meirw translates as the 'field of the dead'.